A review of the vote has prompted a note of thanks to Congressman Paul Tonko, who represents much of the Capital Region of upstate New York including my hometown of Albany, NY. Republican Congressman Chris Gibson, who represents Columbia County and Rensselaer County, also part of the Capital Region, bucked the party line, and deserves kudos. Gibson’s district includes Kinderhook (Columbia County, NY), the location of Roxbury Farm, the source for my CSA food share and also the hometown of Congressman Gibson. 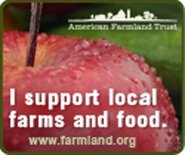 It’s reasonable to presume that his roots in rich farm country, where CSA farms are thriving as noted by this website’s directory of CSA farms in New York, (which includes eight CSA farms in Columbia County and seven in Rensselaer County) encouraged the Congressman to reject H.R. 1599: a bill with the sadly Orwellian titled name (as noted by the Hill Country Observer in its editorial), “The Safe and Accurate Food Labeling Act.” Hogwash.